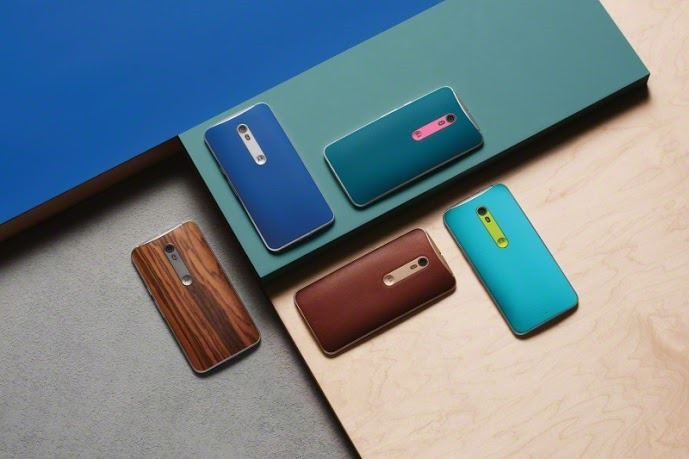 Besides the Moto X Play and the 3rd gen. Moto G, Motorola also announced the Moto X Style. The handset is the company’s flagship handset for 2015 and features the very best in terms of the technology that is available out there. The Moto X Style comes with a 5.7-inch LCD display on the front, with a coated silicon rubber back being present at the rear. The silicon rubber back will be offered in a variety of colors, with Motorola’s Moto Maker option also being available for interested customers to customise the phone according to their liking. The front of the handset also houses stereo speakers that sits right below the top and bottom part of the display. 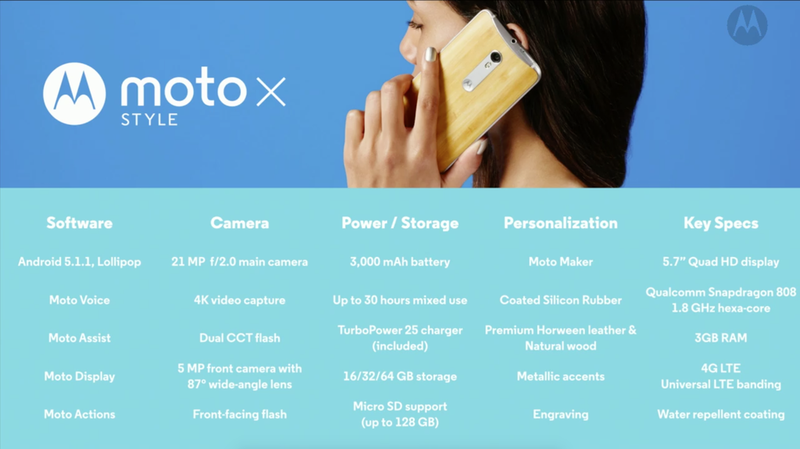 The Moto X Style also features Motorola’s Turbo Charging technology, which the company claims is the world’s fastest charging technology. To demonstrate, Motorola compared the Moto X Style’s charging times against the Samsung Galaxy S6 in which the former managed to offer an additional 10 hours of battery life over the latter with only 15 minutes of charging. Under the hood, the Moto X Style is powered by a Snapdragon 808 processor clocked at 1.8GHz, sports 3GB RAM, 16/32/64GB of storage space, and a microSD card slot. It will also sport a 3000mAh battery that will be capable of powering the handset for up to 30 hours of mixed usage. Motorola phones have never been known for their camera performance, so the company decided to go back to the drawing board with its latest flagship. It has given its processing algorithm a major revamp and claims that the Moto X Style camera is now among the very best in the market. The 21MP shooter on the handset features an F/2.0 aperture with dual CCT flash. There is also a 5MP camera shooter in the front with an 87-degree wide-angle lens and a LED flash. Like the Moto X Play, the Style will run on Android 5.1.1 Lollipop, and comes with Moto’s usual suite of apps — Voice, Assist, Display, and Actions. On the connectivity front, the Moto X Style will come Wi-Fi, LTE, Bluetooth, GPS and the other usual connectivity options. Motorola will also be offering a ‘Pure Edition’ of the handset that will feature universal LTE compatibility with all the major networks in the United States, including T-Mobile, Sprint, AT&T and Sprint. The Moto X Pure Edition will cost only $399 in the United States and will be sold directly through Best Buy, Amazon and other retailers. The handset will be making its way to major markets of the world from September this year. If you are wondering what the Moto X Style packs under the hood, check out its complete tech specs below. 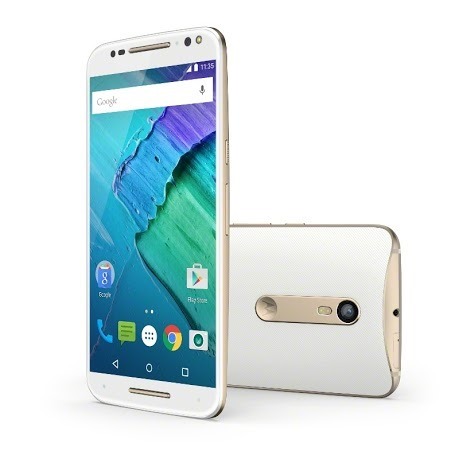 For its specs, its quite amazing that the Moto X Style is going to cost only $399 in the US. What are your thoughts about the phone? Drop in a comment and let us know.